Tips from Amberlea Animal Hospital on helping your pet with storm phobias. Home » Tips from Amberlea Animal Hospital on helping your pet with storm phobias. 1). We addressed Yukon’s symptoms right away. Since storm phobia is considered a progressive behavioural issue, meaning that it can get worse with each storm, it is important that even mild signs of anxiety to storms be addressed. Watch for signs of repeated yawning, lip licking/smacking, pacing, signs of restlessness, whining and howling, and shivering/shaking. 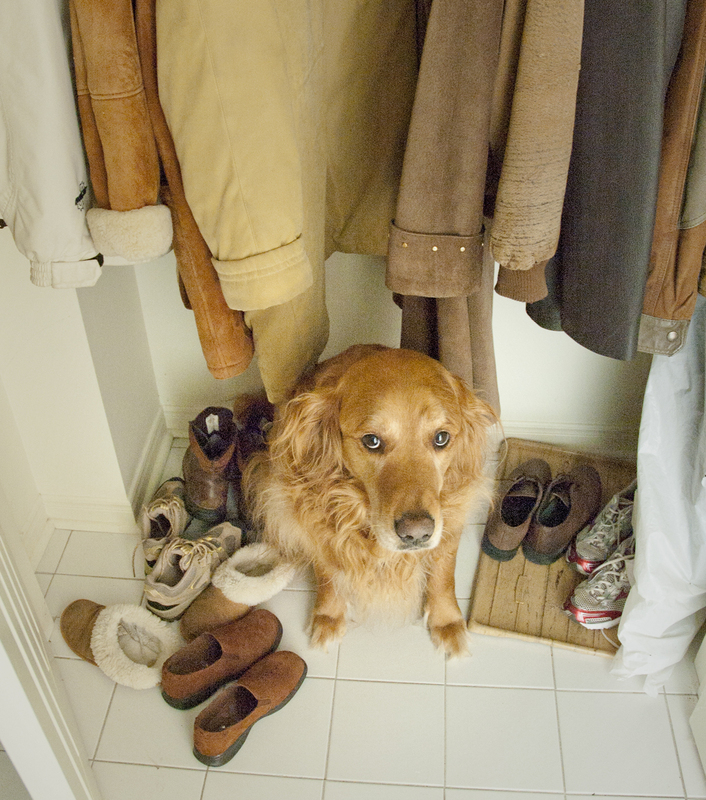 Fearful pets often try to escape from storms by hiding in closets or under beds or the sofa. Fear of storms can be debilitating for your pet. 2). We modeled “appropriate” behaviour. Given that pets often look to us, and other pets in the family to figure out how they should be feeling in any situation, it is important that you act calm and relaxed during storms. I think pets pick up on that energy and behaviour and adjust theirs accordingly. For Yukon, I think the fact my husband and I are not bothered by storms, and we tend to carry on business as usual during them, and the fact that our other Golden, Charley, tends to sleep through storms, was reassuring to Yukon that there was nothing to be afraid of. 3.) We also used distraction. In Yukon’s case he loves to play with the soccer ball. So during a storm we would take the dogs to the basement and my husband, Charley, and myself would play soccer. Because of his fear, Yukon was not very interested in playing at first, but eventually his desire to play overcame his fearful feelings and he joined in the game. Again, I think seeing the three of us having fun, even with the crashing and booming of the storm, reassured Yukon that things were going to be ok. 4.) We established a “safe” place for Yukon to escape to during a storm. We used a crate, and placed it in the basement where the sounds would be muffled and the lightning flashes were not as obvious. We placed a comforter in the bottom of the crate and heavy blankets over the top to help mute the sounds and left the door open because we didn’t want him to feel trapped. Before the next storm, we spent a lot of time associating his safe place with positive experiences, like treats, food, play, etc. This is important because you may not always be home when a storm occurs, and at least your pet will have a comforting place to ride out the storm in your absence. Although we did not need to do this for Yukon, another technique is to desensitize your pet to the sounds associated with storms. I have suggested this technique to a couple of clients and they both found it helpful. Desensitization involves playing a sound recording of thunderstorms at a volume that is audible to your pet but does not create any fear or anxiety in your pet. Then, over repeated sessions the volume is slowly increased until your pet is no longer affected by the storm sounds. For this technique to work it must be done over several months, it is not a weekend fix. If you turn up the volume too quickly, before your pet is accustomed to the present volume, your pet could regress. You need to be patient. Also, this should be done during the non-storm season. If your pet is showing no signs of stress at a specific volume, you can give them treats, food, or play in order to associate the storm sounds with a positive experience – known as counter-conditioning. Now, in Yukon’s case the level of fear was relatively mild, but with more severe cases of storm phobia medication may be required, in association with the techniques suggested above. There are medications that can be administered to help calm your pet and more natural products like pheromone diffusers and collars, the “Thunder Shirt” and other natural supplements. Each pet is different and some things may work better for some than others. Be prepared to try different things until you find what works best for your pet. I hope these suggestions help. For Yukon they were effective, and he now sleeps through storms. As always check with your pet’s veterinarian to discuss the best program to help your pet’s sensitivity to storms.